Each week this winter, we'll be profiling a different Division II & III corps in a feature called "On the Field." Lewis Wilhelm, director of Fever, submitted this first installment. 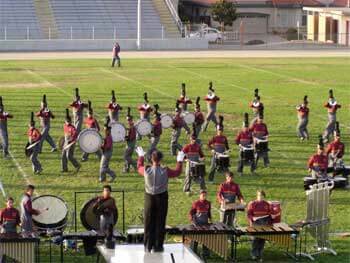 Fever was founded for the purpose of bringing the drum corps activity back to the central valley. Our primary goal is as follows: Give valley youth the best drum corps experience that can be obtained. The staff is devoted to providing the entertainers of our program a healthy and safe environment that allows them to enhance their social skills, communications capabilities, a sense of responsibility and commitment, and discipline. These are the primary lessons the staff of Fever wishes to instill in the members of the corps. A priority of Fever is to develop a strong, collaborative relationship with local music programs. Members of Fever will be primarily students from local high schools and recent graduates of those programs. The skills they learn as members of Fever will enhance the local programs. Fever will strive to become an asset to the programs in the valley. The 2003 season I feel that the 2003 corps was the epitome of success. We started a Division II corps and put a competitive show on the field, all in eight months of preparation and planning. The members of this charter corps have developed a bond that is impossible to describe except to those in the drum corps community that have been a charter member. It was a life-changing experience to watch these members create their own traditions and ceremonies of the corps. They came up with their own prodigals and procedures to many aspects of the corps, all for the fun of tradition. I can't tell you the feeling if gives me to see students putting forth all their energy, passion and love for an activity such as this. The Heritage Fever owns much of its influence from the old corps Valley Fever that was extremely competitive in the early 1980s. I was a member of the 1981, 1982 and 1983 corps, and when names were discussed for our new corps, there was no doubt in my mind that the name had to be Fever. The best part of designing the corps colors, logo and uniform was the way the design team really looked at the old corps (Valley Fever) and how they wanted to use some of that heritage, while still giving the new Fever a fresh look that could be its own. That was impressive, since all of the design team marched with the Santa Clara Vanguard, and Valley Fever had folded long before they had ever marched in a drum corps. When I dusted off the old videos of the early 1980s Valley Fever for the staff, it was wonderful to observe their focus and interest in that old corps. It was my desire to give back to the kinds in the central valley the wonderful experiences I experienced as a kid in drum corps, and I think we've done it. The Future The 2004 season should be an interesting one for the corps, community and drum corps world. Though we have yet to have our first rehearsal, that will be this coming Sunday, Dec. 7. The response from returning and new members is already tremendous. The staff and I hope to have a great showing at the DCI World Championships this summer in Denver. We are all very excited.